If you were to round up a group of long-time Photoshop users and ask them to name a feature in Photoshop that they've never found a use for, there's a good chance the Dissolve blend mode would be mentioned over and over again. While other layer blend modes like Screen, Multiply and Overlay are some of the most important and often used features in all of Photoshop, the Dissolve blend mode, which creates a seemingly random "speckled" pattern as it blends layers together, is usually ignored. Since no one likes to be the unpopular kid, I thought it would be fun to look at a couple of ways the Dissolve blend mode can be used to quickly add more interest to a photo. First, after applying a simple sepia tone effect to our image, we'll add a bit more of an artistic look to it by combining the Dissolve mode with one of Photoshop's filters. Then we'll see how to use Dissolve to easily create a speckled photo border! I'll be using Photoshop CS4 for this tutorial, but any recent version will work just fine. A copy of the image appears on "Layer 1", which is now the currently selected layer. 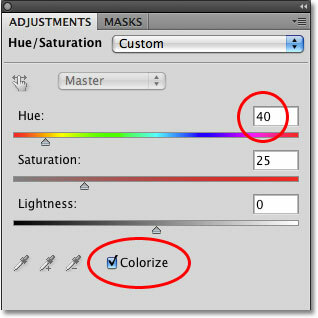 Click on the New Fill Or Adjustment Layer icon and select "Hue/Saturation" from the list. 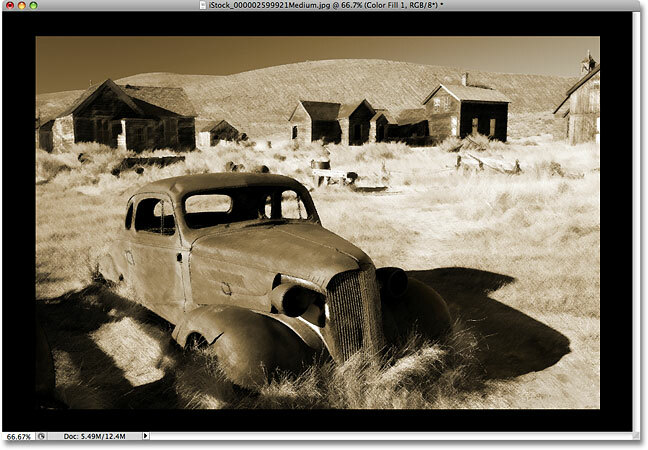 Select the "Colorize" option, then set the Hue to around 40 for a sepia tone effect. Step 3: Change The Blend Mode Of The Adjustment Layer To "Color"
Change the blend mode of the adjustment layer to Color. 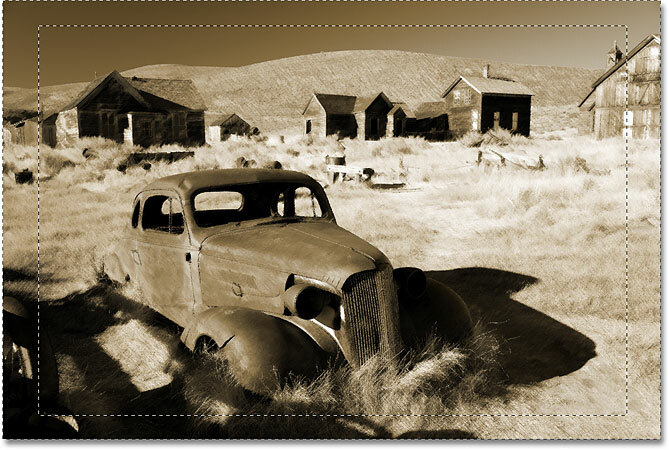 The photo after applying a simple sepia tone effect. Now that we've added our sepia effect, let's add more of an artistic feel by combining the Dissolve blend mode with one of Photoshop's filters. We'll do that next! Click on "Layer 1" to select it. Go to Filter > Brush Strokes > Angled Strokes. Set the Direction Balance to 50, Stroke Length to 15 and Sharpness to 3. A simple painting effect created with the Angled Strokes filter. 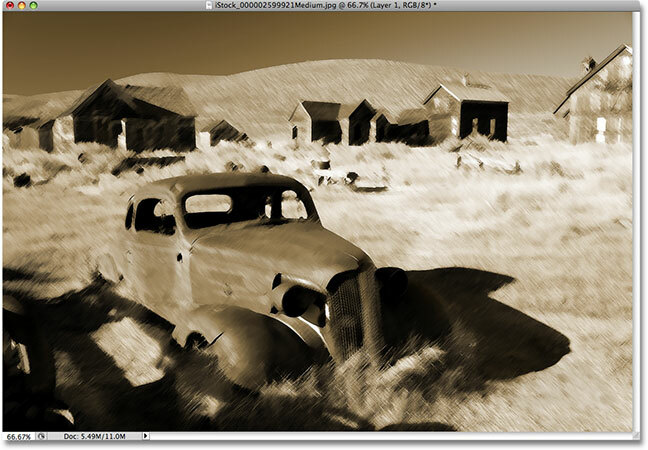 Step 6: Lower The Opacity of "Layer 1"
Lowering the opacity of a layer allows the layer(s) below it to show through. Step 7: Change The Blend Mode To "Dissolve"
Change the blend mode of "Layer 1" to Dissolve. The Dissolve blend mode adds a speckled look to the effect. Click on the adjustment layer in the Layers palette to select it. You can reposition the selection as you drag by holding down your spacebar. Invert the selection to quickly select the border area and deselect the area inside the border. The area to become the photo border is now selected. The fill layers appear above the adjustment layers in the list. Choose a Solid Color fill layer. 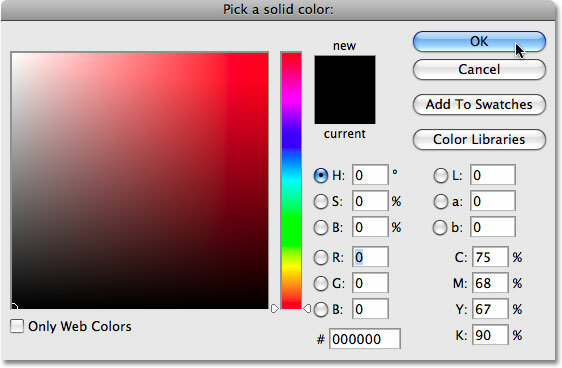 Click OK when the Color Picker appears to accept black as the color for your border. The Solid Color fill layer fills the border area with black. One of the great things about fill and adjustment layers in Photoshop is that they each come with a built-in layer mask. In fact, it's the layer mask for the Solid Color fill layer that's causing the solid black color to appear only in the photo border area. If we look in the Layers palette, we can see that the Solid Color fill layer (which Photoshop has named "Color Fill 1") contains a layer mask preview thumbnail. Notice how the large rectangular area in the center of the thumbnail is filled with black while the area around it is filled with white. The white represents the area in our document window where the fill layer is visible (the photo border). The black represents the area where the fill layer is not visible (the area inside the photo border). A white highlight border around the preview thumbnail indicates that the layer mask is currently selected. 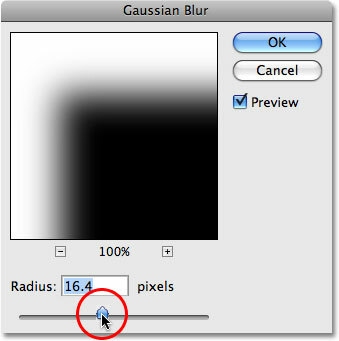 Step 13: Change The Layer Blend Mode To "Dissolve"
Change the blend mode of the fill layer to Dissolve. Adjust the look of your specked photo border by dragging the Radius slider left or right. Photoshop's Dissolve blend mode may not be the most popular kid on the block, especially when it comes to serious photo editing, but as we've seen with a couple of examples in this tutorial, it does have potential when creating special effects. The next time you're looking for an interesting way to blend layers together, give the Dissolve blend mode a try and see what you come up with! Just remember that Dissolve only works with semi-transparent pixels, so you'll need to either be working with a layer mask as we did here when we created our photo border or you'll need to lower the opacity of the layer before you'll see any results with the Dissolve blend mode. And there we have it! That's how to create photo effects with the Dissolve blend mode in Photoshop! Visit our Photo Effects section for more Photoshop effects tutorials!